It might actually make air conditioners and refrigerators more efficient. 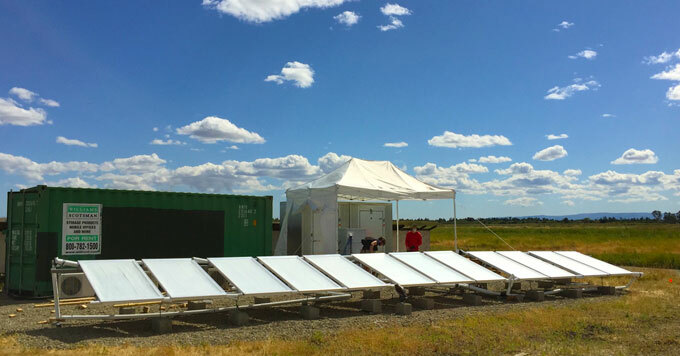 Panels are integrated with off-the-shelf air conditioning and refrigeration systems in a field trial demonstration. Photo: Courtesy of SkyCool Systems. Sending heat into outer space may sound like science fiction, but a new technology does just that to help cool buildings more efficiently. It makes use of a natural phenomenon. Aaswath Raman is part of a Stanford research team that developed the cooling panels. When placed over pipes of warm water, they draw heat out of the water, then convert and emit it at a wavelength that passes into outer space. Plus, the panels are made from a high-tech material that reflects light from the sun, adding to their ability to keep things cool. The researchers founded a company called Skycool Systems and are testing the panels as a way to cool air conditioners and refrigeration units so they run more efficiently. But they’re also further developing the technology. Raman thinks the underlying concept could transform how whole buildings are cooled. That, he says, will be critical as the climate warms.